Tributes have been pouring in following the death of French New Wave filmmaker Agnès Varda, who passed away on Friday at the age of 90 after battling cancer. The first woman to win an honorary Golden Palm at Cannes, Varda was the only woman director in the free-spirited New Wave group, which included Jean-Luc Godard, François Truffaut and Eric Rohmer. The French New Wave emerged in the 1960s as an intellectual cinema movement and its influence on arthouse cinema is still very present. 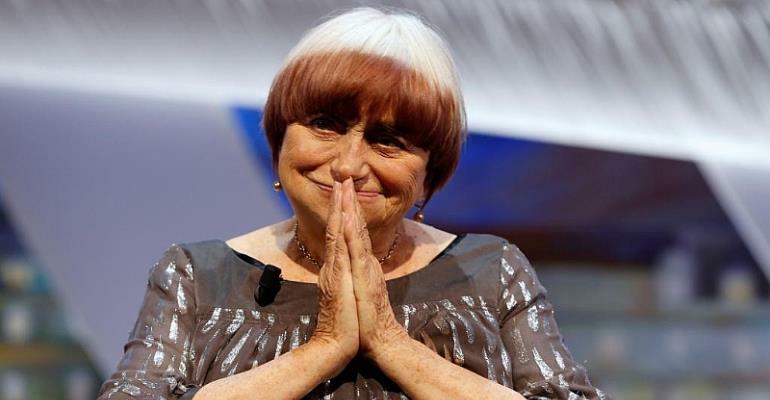 Varda stood out physically because although she wasn't tall, she had strikingly big eyes and a pudding bowl haircut, always with an all-round fringe a different colour from the rest. Most recently, at February's Berlinale Film Festival, her hair was white on top and the border was her trademark maroon. Although she was unwell, Varda collected her lifetime achievement award in person at the festival, which also premiered her latest documentary, Varda by Agnès. Even though her sight was failing, Varda remained prolific. Last year she won an honorary Oscar for her documentary Faces, Places, which serves as a visual ode to France and was made with photo and video artist JR.
Varda was first noticed in 1962 with Cléo from 5 to 7. In 1985 she won the Golden Lion at the Venice Film Festival for 1985 film Vagabond. Her husband Jacques Démy's famous musicals like The Umbrellas of Cherbourg and the Young Women of Rochefort and Bay of Angels, sealed her fame. Varda will also be remembered for documentaries on the United States and Cuba and Vietnam in the 1960s and 70s, and for her photographic work. In 2007, She was commissioned to create an exhibition and installation at the Pantheon in Paris to pay tribute to those known as the “Just of France”, more than 2,500 French people who have been identified as having saved Jewish people in France under Nazi occupation in World War Two.